Ladies and gentlemen, may I present Bing Crosby and Don King in really bad makeup! Be honest....who now has that song running through their heads? Or, who remembers the characters, but can't remember their names or the song I'm talking about? Allow me to jump start your remembery for you. The blue fellow is called Bocephus and the red/orange guy is called Smegma. They were the costars of the popular holiday extravaganza, 'Vladimir Bunny's Communist Easter Purge'*. Here in the States, we typically see it air on Arbor Day. Ok. That was a lie. 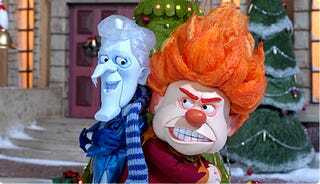 (But tell me you wouldn't watch the show just once....) They are actually the Snow Miser and Heat Miser. Two of Mother Natures sons who fight with each other over hot and cold in the Rankin-Bass holiday special 'The Year Without Santa Claus'. But I had to lie. Lies spawn funny. Sometimes. Besides, today is Made Up Monday! The day where I make things up. Or I don't. I definitely remember those two, though. They used to scare the hell out of me when I was a tiny tot. They were mean to Rudolph, and they threatened to stop Christmas. So, of course they scared me. But I couldn't let anyone know about that fear when I was a child. If I told my parents, I wouldn't have been allowed to watch it. And if I told my sister, my older sister, I would have been tortured mercilessly. So I dealt with it. But how does a small child deal with fear, especially when laying in bed, alone, at night? Why, I developed a way of changing my fear into something happy by singing myself a song in my head. And what song did I sing? 'Snoopy Come Home', from the 1972 movie of the same title. This might seem like a strange song used to cheer up a small child since it's about Snoopy running away from Charlie Brown. But for some reason, it worked for me. I would lie in bed, close my eyes, and loop this song over and over in my head. And while I was doing this, I was bringing forward pictures of cartoon characters in my mind. But not just, like, a regular slide show. Nope, I'd bring them in, spinning, from the background, growing larger until they took up the whole frame in my mind. Anyway, you can laugh at me all you want. But that's how I used to drive away the boogey man and allow myself to sleep. And I'f I'm going to be perfectly honest, when my mind is racing at night, preventing me from sleeping, instead of taking the Lorazepam my doctor gave me, I'll give good old Snoopy a try first. It's not to banish any fear, but to clam my mind by forcing it to slow down and think about Snoopy while picturing old cartoon characters. (the song has a calming rhythm and the cartoons force me to push stress to the back of my mind). Go ahead. Laugh at me. I don't care. My feelings? Not hurt at all. But I'm not here to talk about a childish way of beating fear. I'm here to talk about hot and cold. You can have one or the other, but you can't have both. Well, normally you can't. I mean, if it's summer out, and you're outside on that hot and humid day, and you walk into an air conditioned house, it might seem cold. And vice-versa. But when it comes to hot and cold, unless you use some kind of mechanical intervention, they can't co-exist, right? Well, not really. Take a deep-sea vent. This is an area where hot gas from the core of the Earth escapes into the depths of the ocean. In the outflow, the water can be 140 degrees while just inches away it can be 33 degrees. But in that case, there is a defining line between hot and cold. And when ever you have head and cold in close proximity, there will always be a defining line. But what is heat? And what is cold? They are movement. Actually, they are the measurement of collisions. When something is hot, what is actually happening is, energy is exciting atoms to the point where they are moving around rapidly. The faster they move, the more they smash into other atoms. And it's the atoms smacking into each other that creates heat. Cold is actually an absence of heat. For example, the suns rays don't excite the atoms as much in the winter as they do in the summer because thy are striking at a more obtuse angle. Therefore the atoms aren't colliding as much, and as such, the temperature is lower. Space is very cold. But not because the sun doesn't excite the atoms that are there. It's because in the vacuum of space there are fewer atoms to smack into each other. When space craft heat up during re-entry, it's not because the atoms are more active. It's because there are more atoms to react with each other. But while hot and cold can exist side by side, they can't coexist, right? Well, here's the spot when you need to pay attention. I'm about to give you a fact, and you get to tell me if it's true or false. Not only do heat and cold coexist, their physical incarnations happily live together. And what incarnations would those be? Why, fire and ice. Fire is heat and ice is cold. And we know that if you mix the two, the ice will cool the fire, and the fire will melt the ice. Except when it wont. There is a planet where the ice burns. Not some kind of dry ice either. I'm talking actual water ice burns with actual fire. As in, the ice we know, and the fire we know. Ice burns. Now, am I lying, or is it true? Can water ice burn? I'll be back tomorrow with the answer. * I was originally going to use the word 'Pogrom', but I figured I'd go with the more non-denominational 'Purge'.